It’s been more than two months since I’ve done an honest-to-goodness post and put it on this blog, which is inexcusable**, so if you’re actually reading this, I thank you for hanging in with me. Back in January ’12, Dimension Films announced (by way of Deadline Hollywood ) that it had acquired the US rights to a heist comedy called,The Black Marks, with Kurt Russell, Matt Dillon and Jay Baruchel attached. Since then, the film, written and directed by Jonathan Sobol (writer/director of the well-received, if little-seen, indie A Beginner’s Guide to Endings), has gotten a new title and added the great Terence Stamp. Now called The Art of the Steal, it debuted at TIFF last September and is now due to open here in the US on March 14, courtesy of The Weinstein Company off-shoot, Radius-twc. Despite the fact that they’re going after the Guttenberg Bible, this does not, in fact, look like high art. It looks like a rather slight caper-comedy, but it does boast a pretty good cast. I bring it to your attention because 1. it’s been a long time since Kurt Russell has done anything (one film in five years), let alone had what looks like fun on screen. 2. Terence Stamp 3. March is looking a little bleak at the multi-plex 3. If you’re STILL snowed in, one of Radius-twc’s raisons d’etre is multi-platform releasing, so you still get to watch it and in your jammies with bowl of popcorn and a mug of cocoa in front of a raging fire, to boot. In fact, it’s available now, before it gets to theaters, via iTunes. A number of reviewers who saw it in Toronto called it a fun take on a familiar genre, with some great dialogue. Sounds like a good matinee to me. 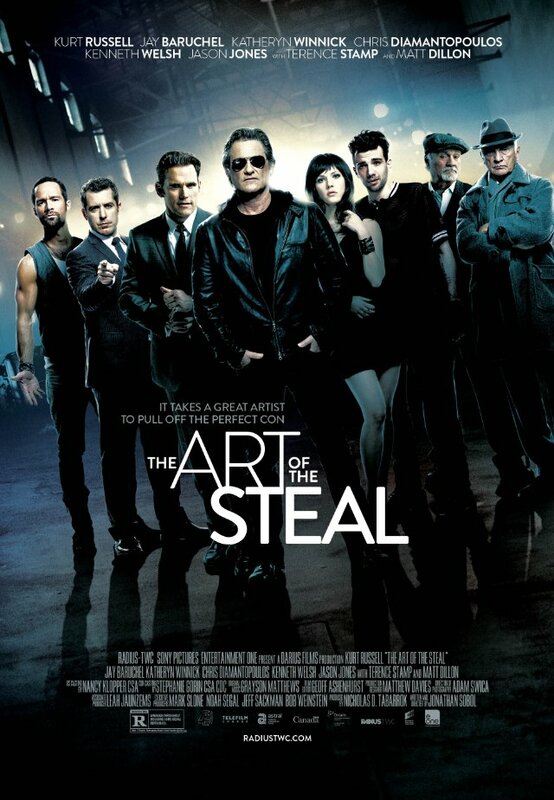 The Art of the Steal also stars Katheryn Winnick of “Vikings”, Stephen McHattie, Chris Diamantopoulos (the only thing worth remembering from the Farrelly Brothers’ The Three Stooges movie AT ALL) and Jason (“The Daily Show”) Jones. Bit of trivia: did you know he’s married to Samantha Bee? Me either. The release date, March 14 will be shared by a slew of new movies including Jason Bateman‘s directorial debut, Bad Words, the eponymous Veronica Mars crowdfunded flick, Fast & Furious clone Need for Speed, Tyler Perry’s The Single Mom’s Club (ugh) and the US debut of the possible Best Foreign Language Oscar Winner, The Great Beauty, none of which I’m excited about. There is a film, however, that I am. Enemy is Denis Villaneuve‘s 2nd pic with his Prisoners star, Jake Gyllenhaal. Gyllenhaal walked off the Prisoners set and on to the set of Enemy, filming the two back-to-back. 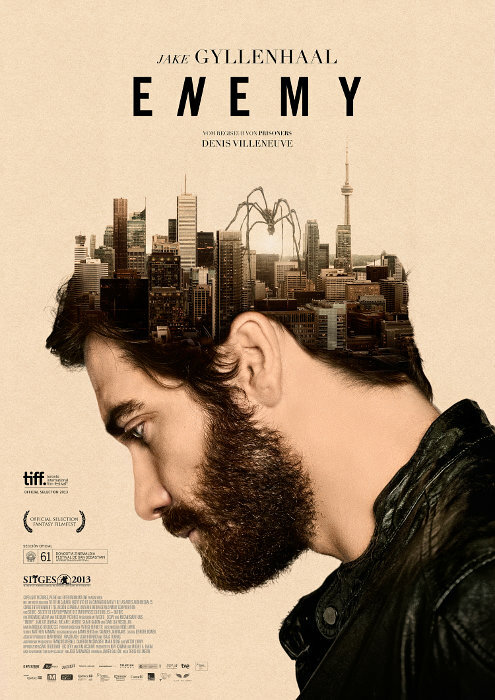 He and Villaneuve have been singing each other’s praises since both Enemy and Prisoners opened during TIFF 2013, and as good as Gyllenhaal as in Prisoners (and he was terrific), he is reportedly the best he’s ever been in Enemy. March 14 is, of course, the date of release in New York. Hopefully it will roll out to other “select cities”, or at least pop-up on On Demand, shortly thereafter. Again, if you’ve gotten this far, thanks for reading. I promise my Oscar post will be finished BEFORE the ceremony. **I have been hanging out at my brand new Facebook page. Facebook is the debil I tells ya!